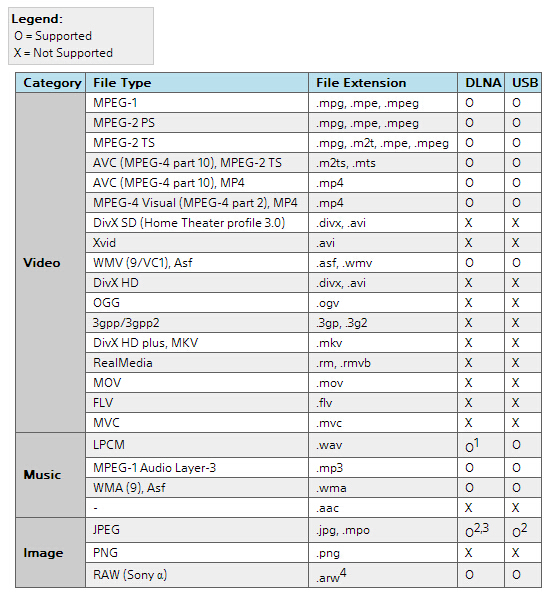 The MKV file format is supposed to be universally compatible across all platforms and operating systems. 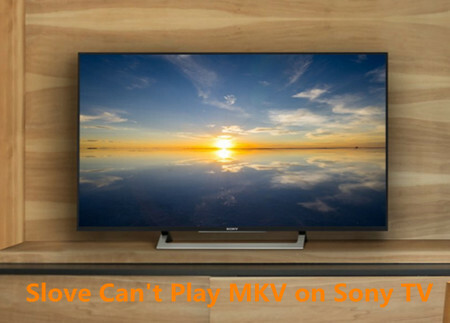 However, there will still be times when you would fail to play MKV files on Sony TV. Your Sony TV may say that the format is not the supported format and Sony TV can’t recognized the MKV files. So what’s the matter? Read on for details. Why sometimes Cannot Play MKV on Sony TV smoothly? To solve “Sony TV not playing MKV” issue, a widely recommended solution is convert MKV to Sony TV more compatible MKV format. Pavtube Video Converter(compatible with Windows 10, Windows 8.1, Windows 8, Windows 7, Windows XP) is an easy-to-use tool to help you fast and batch convert MKV to Sony TV supported file formats with zero quality loss on matter what models your Sony TV are, like Sony Bravia TV, Sony Smart TV, Sony LCD TV, Sony 4K TV etc. The program also supports encoding/re-encoding many other popular video formats like MKV, MP4, H.265, FLV, AVI, VOB, MOV, WTV, AVCHD, TMS, MXF, MVI and more. Besides converting video to Sony TV, it also can convert video to Samsung TV, LG TV, Panasonic TV and etc friendly playing-format. PS: If you’re a Mac user, simply turn to Pavtube Video Converter for Mac (macOS Sierra, El Capitan Yosemite, Mavericks, Lion included)). Now download the right program and follow the simple guide below to start encoding/re-encoding MKV files for Sony TV. 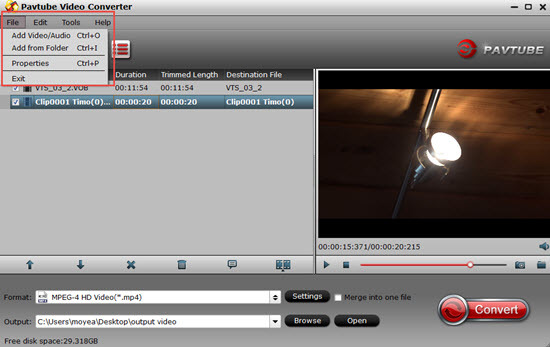 Install and run the best MKV to Sony TV Converter, and then import the source MKV videos to it. To do so, you can directly drag & drop the files onto the main interface, or you can click the “Add video” icon on the upper left to locate the videos from your local disk. Note that batch conversion is supported, so you can add several files to the converter at one time. Click “Format” bar and turn to “TVS” category. 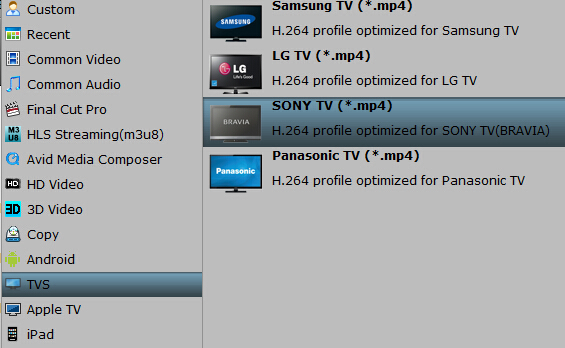 The program has a number of presets for Samsung/Sony/Panasonic/LG TV. Here “Sony TV (*.mp4)” preset is recommended for playing on Sony TV. Note: If the default video/parameters can’t meet your needs, just click Settings icon to adjust the video codec, bitrate, frame rate, audio sample rate, etc to get a decent video as you want. When you finish the settings, you can press the big “Convert” button to kick off the conversion. By using future-proof technology, the conversion will be finished with ultrafast speed and the best video quality kept. After the conversion, you can then stream and play your MKV videos on Sony TV with easy.